United Poultry Concerns first learned about the Orthodox ritual of “swinging” and slaughtering of chickens in the days preceding Yom Kippur - the Jewish Day of Atonement - back in the 1990s. What happened was that one of our members, Cherylynn Brown, discovered that across the street from her house something disturbing was happening. In her report for United Poultry Concerns, published the following year on September 18, 1997, Cherylynn wrote about her experience. Here is an excerpt from Kapparot “Broiler” Chickens by Cherylynn Brown. “I was living in Santa Monica, California, across the street from Rabbi Levitansky on the night of the slaughter called Kapparot. On Friday, September 19, 1996, I entered the Kapparot shed with the rabbi’s son. Inside were approximately 200 large chicks about 7 weeks old. Their youth was evident from the video I shot where you can clearly see their small combs and wattles and hear their chirping baby voices. “Their white feathers had urine and feces covering them so that they were a dark yellow-brown. Filth had crystallized on their feathers into hard stones along their undersides. When I found them, they were wet from lying on the plastic cover on the concrete floor that was covered with urine, feces, and blood. “Of the five holding pens, only two had containers of drinking water - and those were brown, full of excretions. I asked that they receive fresh water, and the children were happy to fetch bottles of clean water for the chickens. I brought over a bag of scratch grain. 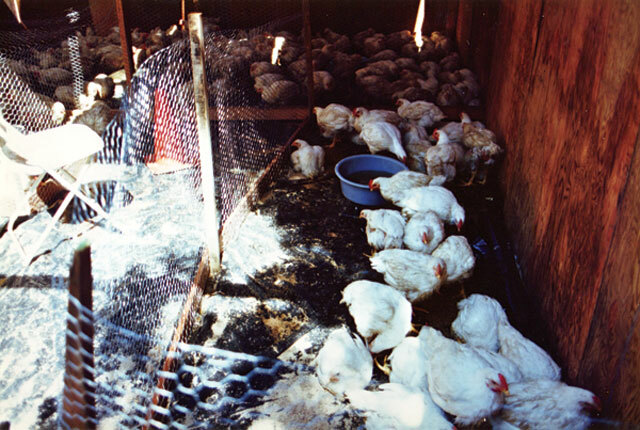 Dozens of chickens were unable to stand or walk to get to the water or food. They remained motionless or trembling from their cold damp feathers and physical pain. Others were frustrated at not having the strength to stand and walk. Many had deep wounds cut into their flesh. Chickens sometimes bite each other due to the stress and shock of having been deprived of food and water. “I asked and was granted permission to remove the dead birds. 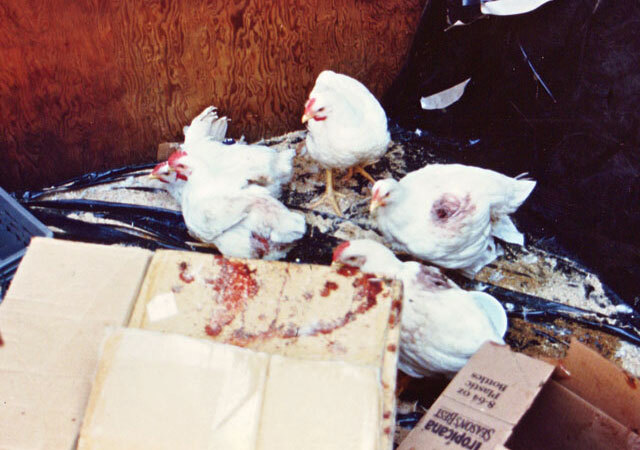 I filled four large boxes with corpses of swollen purple bodies that were sprawled across the concrete and in a pile in the corner where they were covered by the live birds who clung to them. . . .
“I persisted with my concern about the suffering of the existing chickens. I asked if I could have the chickens who were obviously dying, pointing to several large bloated, featherless purple bodies with wet backs and shallow breathing. I was told that as long as they were breathing, they had to be used for sacrifice. “There I stood with the rabbi’s son, as both of us faced a strange need for change in this predicament of a ‘straight-jacket’ hold of an old family custom. He told me that he himself was a vegetarian and was quite aware of the damage that poultry production has done to the environment and humane health, as well as factory farming’s violations of the natural behavior patterns of farm animals. But he said he felt there was nothing he could do because this project belonged to his family. He offered boxes for me to take the bleeding birds as long as I stopped at sundown, which was soon. . . .
“I grabbed the filthy boxes laced with blood and filled them with birds to take across the street. One hen died in my hands as I put her in the box. Four chickens had bones exposed up to 3/4 of an inch. Only one, Julie, lived. The others would be diagnosed with chronic pain and irreversible injury due to swollen bones, and euthanized at Center Sinai Animal Hospital on Saturday. Along with open sores and exposed bones, one hen had a completely gangrene wing that had started bleeding from ruptured swollen tissue. Many suffered from respiratory problems and had yellow pus marks on their skin. One bird was completely blind and several could not stand or walk. By Saturday two more birds had died and I spent the morning nursing wounds and stabilizing the flock. I took the four birds with severely damaged wings to my veterinarian, Dr. Spira. All four had to be put to sleep because their broken, swollen and protruding bones would never heal. “Later in the afternoon I returned to Rabbi Levitansky’s house. I was greeted by his family, as the rabbi was out. I gathered the newly dead birds and carried the boxes to the dumpsite. I cleaned the live birds’ water and brought them more food. In desperation for food, many birds were eating parts of other birds. Again I was allowed to carry the birds with bloody sores home, as long as I stopped by sundown. Sundown quickly came and my time was up. I said goodbye to the birds who remained, never to see them again. Cherylynn Brown’s full report, “Kapparot ‘Broiler’ Chickens,” can be read at www.upc-online.org/kapparot.html. Visit www.upc-online.org/kaparos for this and other features of our campaign to eliminate chickens from kapparot rituals.